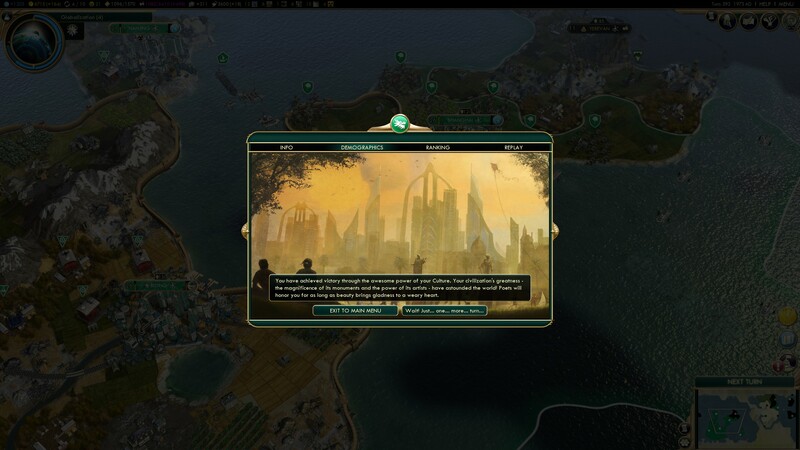 One thing I wanted to accomplish before Beyond Earth releases is to win a cultural victory in Civ 5. So I started a small map, 2 continents, 1 other civilization, and several city-states (4 or 5). 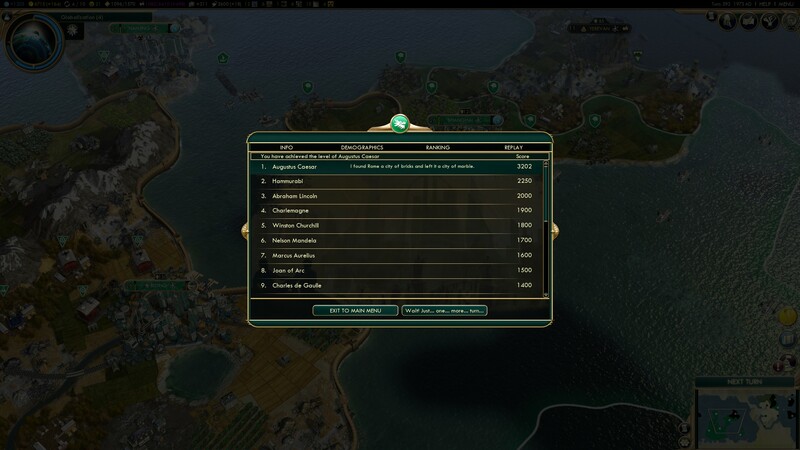 And besides fight off barbarians, I didn’t do any other fighting: I just left the other civ alone (easy since it was on the other continent), and ignored the city-state on my own land mass. I spent the game working my land/sea and building up my empire. In the mid-game I had a surplus of gold, so I simply bought a few buildings and otherwise built up anything with a culture bonus. Every great musician/artist born in my empire created a great work; most great scientists build labs or instantly researched technology, etc. Since I dominated the research tree, I placed all my spies in my own cities to work as counter-intelligence. They caught/killed at least a dozen of the other civ’s spies. Every time the game showed the apology screen, I forgave rather than take the other option (which I supposed was declare war?). In the late 1960’s, as I was about to click “next turn”, I got the “you’ve won a cultural victory” screen. Woot! But to be fair, this was on normal difficulty against one other computer civilization. I’m sure another player would present a much greater challenge. As would playing a larger map with more civilizations. Being on the other continent with only a single city-state on my side to compete with was a major boon. Still, it was fun just building an infrastructure and not winning through military victory. I’m looking forward to Beyond Earth!